Source: CICH graphic created using data adapted from the Public Health Agency of Canada, Maternity Experiences Survey, 2006-2007 http://www.phac-aspc.gc.ca/rhs-ssg/pdf/tab-eng.pdf – accessed July 15, 2017. Mothers who score above 13 are likely to be suffering from a depressive illness of varying severity. Younger women 15 to 19 years old were almost twice as likely to score ≥ 13 – than some of the other age groups (14%). **The MES population consisted of birth mothers 15 years of age and older who had a singleton live birth in Canada during a three-month period preceding the 2006 Canadian Census of Population and who lived with their infant at the time of data collection. Using the 2006 Canadian Census, a stratified random sample of 8,244 women estimated to be eligible was identified. Of these women, 6,421 (78%) completed a 45-minute interview at five to 14 months after the birth of their baby, conducted primarily by telephone. 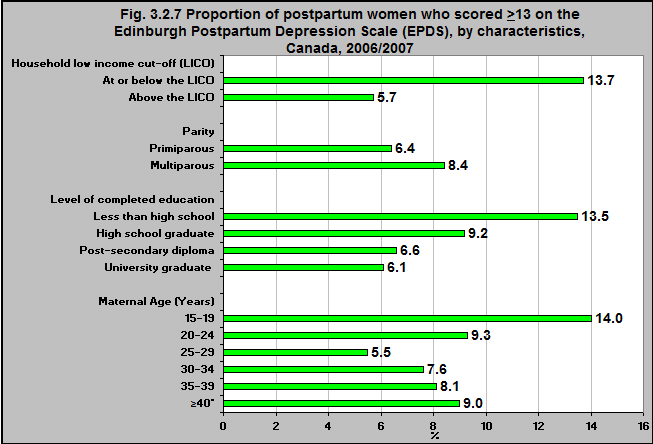 The MES assessed women using the Edinburgh Postnatal Depression Scale (EPDS), a 10-item screening tool to identify postpartum depression at the time of its administration. A score of 13 or higher on the EPDS is considered indicative of postpartum depression and a score of 10 to 12 is indicative of being at risk for postpartum depression. The MES asked women whether they had ever been prescribed antidepressants or been diagnosed with depression prior to their pregnancy. Women were also asked whether they had received enough information on postpartum depression during their pregnancy and whether they had support available to them when they needed it since their baby was born. 1Public Health Agency of Canada, Maternity Experiences Survey, 2006-2007. http://www.phac-aspc.gc.ca/rhs-ssg/pdf/tab-eng.pdf -accessed July 24, 2017.